The Howard Hughes Medical Institute – Janelia Farm Research Campus houses flexible, state of the art research laboratories as well as a conference center and support facilities, in an integrated structure designed to LEED Gold standards. Set into a gentle hillside on a 689-acre woodland site, the terraced building blends into its lush surroundings through an 18,000 square foot green roof that is the second-largest in the United States. Planted with native species of grasses, flowers and other plant varieties, the roof contributes to the overall project’s storm-water management strategy, which also employs retention ponds that help organize the experience of the site and enhance views throughout the complex. 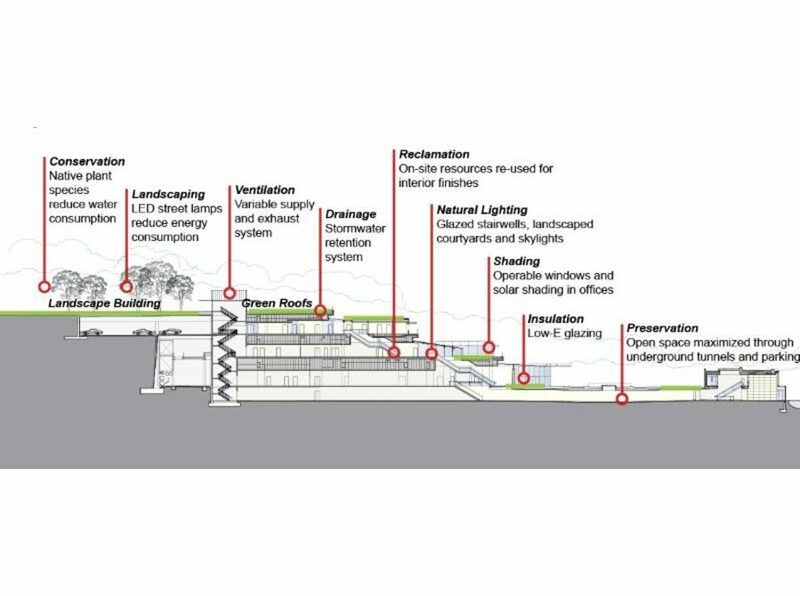 Research laboratory workplace environments receive abundant natural light by means of a structurally-glazed sinuous corridor which runs the length of the 1000-foot building and also connects the labs to office “pods” overlooking the roof gardens.